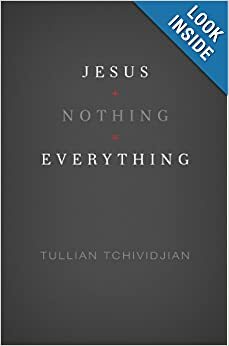 Tullian Tchividjian wrote a book called, “Jesus + Nothing = Everything”. I have taken a look at it on Amazon to see if it would be an interesting read. I began to look at the comments to see what others said about this book. I looked at the lowest scores and saw that my former pastor, Michael Fabarez had critiqued the book. His criticism was a clear example of conflicting theologies. His comments attacked the type of sanctification Tullian proposed. Pastor Fabarez employed scriptural ‘proof texts’ to refute the non-‘biblical’ view of sanctification that Tullian was supporting. To understand why Pastor Fabarez did this, one needs to explore the foundation of his thinking. He is completely invested in Lordship Salvation theology. Lordship Salvation theology teaches that from beginning to end, our faith works synergistically with God’s grace in obedience so that we can be Holy Christians. The presupposition is that we have enough good in us to say yes to God by making a decision for Him. Our will has the ability to say yes to God. In fact, the human will is seen as a sort of ‘neutral agent’ or even a positive, sinless agent in relation to God. Thus, the synergy of human will and God’s demands in Scripture continues throughout the Christian life. The reformers of the 16th century dealt with similar theologies. Luther used the term ‘Semi-Pelagian’ to characterize the Roman Catholics who held this view. Calvinists had to confront Arminians who held to the synergistic model, as well. Lordship Salvation may appear to be evangelical, but this is an illusion. It is nothing more than a re-hash of the medieval ‘divine spark’ theology of the Roman Catholic Church. With such a strong faith in human will, it is also a rejection of the biblical concept of total depravity as seen in the letters Paul wrote to the Colossians and Ephesians. What can this mean, ‘And you were dead in your trespasses and sins’ (Eph. 2:1) or, ‘And you, who were dead in your trespasses and the uncircumcision of your flesh, God made alive together with him, having forgiven us all our trespasses’ (Colossians 2:13). Neither of these verses supports the idea that we have the smallest ability to ‘repent and believe’ by an act of will. The other significant issue is that of sanctification. This is where Lordship Salvation proponents really dig in their heels. Sanctification is a matter of total surrender and obedience to the commands in Scripture. The Reformed call these ‘imperatives’. These imperatives fit into a model of biblical interpretation. Lordship Salvation adherents interpret their Bibles more than literally, however, they interpret their Bibles literalistic-ally. That is, everything, even poetry, analogies, metaphors and parables are bent into shapes they were never meant to hold. Anything that is not a command or directive is seen as secondary to the life of the believer. Scripture is used aggressively within the church and against those outside of Lordship Salvation. Instead of examining the hermeneutics one uses, adherents simply assert, “the Bible says it”. Context, original purpose, audience, and the overall narrative of Scripture are minimized for the argument one makes from a single verse. And, the overall narrative is misunderstood, as well. It is a narrative of Law as lord. It is important to remember that there was a 400+ year span between Abraham (faithful) and Moses (thus, the giving of the Law) when faithful people had no Law. It is also lost in the discussion that Christ perfectly fulfilled the Law for you. Instead, the emphasis is on the ability one has to repent, believe, and obey. In short, Lordship Salvation is an invitation to centering your belief on … yourself. The reformers called it, ‘incurvitas en se’, or ‘being curved in on oneself’. It is the perfect theology for the self-centered people of our present-day culture. You are still in control. No need to be crucified and resurrected, just dusted off and shined up a little. No need for Jesus, just a strict moral adherence which will make you right as rain. The ultimate goal is the binding of the will to God’s commands. The Law is not used properly in such a hermeneutic. Instead of being a mirror by which one sees his/her own sin, the Law is tailored and pacified into achievable goals to live by, instead of the raging lion that reveals our total sinfulness. Contrary to Lordship Salvation’s foundational belief about the human will, the will is neither neutral nor good. Jesus says so in Matthew 23:37 and in John 5:40. Contextually, the latter verse is addressed to the ‘religious’ people of Jesus’ day (read Pharisees) who “… search the Scriptures, because you think that in them you have eternal life …” However, they missed the point, “… and it is these that bear witness of me” (emphasis mine). To believe that the will is somehow entirely sanctified after one repents and believes is to deny the reality of sinfulness. It is to say that when we sin, it is not sin, but just a mistake. It is no wonder Pastor Fabarez must aggressively attack Pastor Tchividjian’s book. He isn’t just fighting for his ideas, he’s fighting to keep the Old Man (read ‘Old Adam’) in control. He’s fighting to keep the Old Adam alive. He’s fighting to keep the Holy Spirit’s work of magnifying Christ out of his church. He’s fighting to continue being god, as are all those who hold to Lordship Salvation.